The Bathroom Reader's Institute UJBR boasts more than 12 million books in print and a membership base topping 40,000 loyal readers . . . The Great Myths of William Shakespeare! Uncle John's Weird Weird World: Who, What, Where, When, and Wow! We’d love your help. Let us know what’s wrong with this preview of Uncle John's Weird Weird World by Bathroom Readers' Institute. We’d love your help. Let us know what’s wrong with this preview of Uncle John's Perpetually Pleasing Bathroom Reader by Bathroom Readers' Institute. What is your favorite position to be in while reading? We’d love your help. 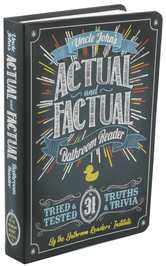 Let us know what’s wrong with this preview of Uncle John's InfoMania Bathroom Reader For Kids Only! by Bathroom Readers' Institute. We’d love your help. Let us know what’s wrong with this preview of Uncle John's Smell-O-Scopic Bathroom Reader For Kids Only! by Bathroom Readers' Institute.